Make your demand management transparent and organized. Thanks to the eBRÁNA system, you will be able to classify and evaluate the demand, thus you will be able to answer yourself to what extent are your investments into marketing effective. Are you investing into SEO, Facebook or PPC campaign? And are you able to evaluate the forms or telephones you get from such marketing tools? Alone, these marketing tools are telling nothing, you will not know how many deals you have made thanks to them or whether is the investment you give to marketing returning or not. With demand management, you will know. And you will also be able to increase the potential of successfully gained deals. What exactly is the demand management system capable of? Have you got an e-mail with a demand? 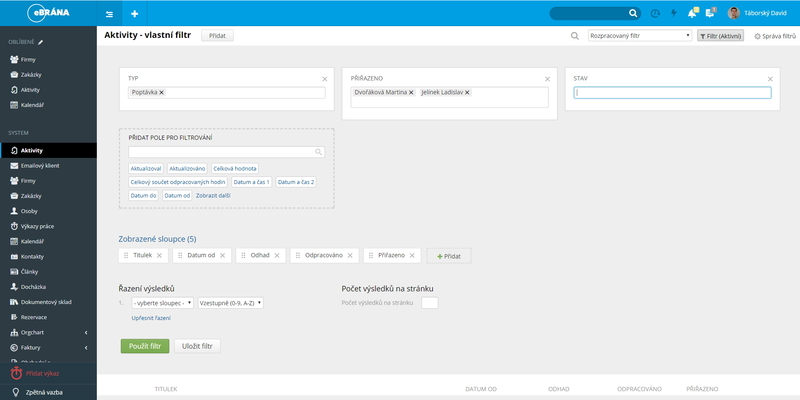 With one click you can assign the customer into the central database. Even if the deal failed, you can use the contact further, e.g. for newsletter. You can create task from an e-mail with one click. The task will notify you in time to take care of your customers. You do not have to carry all of your work in your head, you now have it in one, organized, place. You are able to view your whole history of communication with customers. From the very first e-mail to the final evaluation of the business case. For every demand and every sales manager, you will see how are the deadlines met and the progress of implementation. When a sales manager gets ill, his colleague immediately knows at which point to start the communication with a client. Managers are able to easily monitor work of salesmen and demands they are currently working on. The manager has the information, outcomes and other events well organizes and still before his eyes. Online, from a tablet, mobile phone, computer, from a company or fieldwork, you are able to monitor the successfulness rate of recieved demands. You will see which were successful and the benefits they brought to your company. Outcomes may be monitored in present time and compared on a monthly, quarterly, biannual, or annual basis. Check the pricelist for the price of demand management system. Check the video to see the demand management system in work. Discover the possibilities of modules, which come free with the demand management system – e-mails, calendar, contacts, and tasks. Check another system, the Team tasking and project management system. Read how would coopeartion between our companies start after the implementation of the eBRÁNA system.